The School Calendar for School Year (SY) 2015-2016 shows the school events and activities for the said SY. The core events and activities for this SY, which represent the actual teaching-learning days, shall be strictly observed in all schools. The school year shall formally open on Monday, June 1, 2015 and shall end on Friday, April 1, 2016. The school year shall consist of Two Hundred One (201) class days. This is inclusive of the 5-day semestral break. The parent-teacher conferences shall be held on the second or third Saturday after every quarterly examination. The conference is intended to apprise the parents on the progress of performance of their children and ensure parental involvement in school activities. The last week of every quarter shall be the culmination of students’ outputs and performances in order to demonstrate attainment of performance standards at all grades/year levels. To ensure quality in the school operation and actual teaching-learning, a 180-day non-negotiable contact time for teachers, and the physical presence of school heads is expected every school day, even during attending official business, the 201 days shall be enforced. As part of the opening rites, all schools are expected to conduct a general assembly for the purpose of orienting stakeholders on the curriculum, co-curricular programs and ancillary services lined up for the year in support of learner development and continuous improvement of school outcomes. Orientation shall be done the week before the first day to ensure that conduct of classes is done from the first day of classes. For the secondary level, the general orientation shall include a career exposure program for the Grades 7-10 students to acquaint them with the various career pathways they can pursue. Meanwhile, a career guidance program for Grades 9-70 students, shall be conducted between July and November 2015 to help prepare the students for possible careers or courses they wish to pursue after high school. All elementary schools shall administer the Early Childhood Development (ECD) Checklist for Kindergarten Children during the opening of classes, midyear and end of school year and the School Readiness Year-End Assessment (SreYA) at the end of the school year. The Philippine Informal Reading Inventory (Phil-IRI assessment tools shall be administered to Grades 2-6 as classroom-based assessment within the school year. The result will be used as basis for planning and formulating appropriate interventions for children. Meanwhile, all secondary schools shall perform a diagnostic assessment on the readiness for learning of Grade 7 students in order to prepare developmentally-appropriate intervention programs. At the end of the Second Quarter, a midterm break shall be observed to evaluate individual teachers and their collective performance, as well as to conduct the In-Service Training (INSET) activities in support of the continuing professional development. The Christmas break shall begin on Saturday, December 19, 2015. Classes shall resume on Monday, January 4, 2016. To assure quality of the pupil’s/student’s learning, formative assessments shall be regularly conducted by the teachers. On the national level, the National Education Testing and Research Center (NETRC) shall administer the National Career Assessment Examination (NCAE), the Language Assessment for Primary Grades (LAPG) and the National Achievement Test (NAT). The NCAE shall be conducted to assess the aptitude and interests of high school students planning to proceed to post secondary course and other career options and to provide them with relevant information on their skills, abilities, and readiness for academic and non-academic courses which help them make wise career decisions. On the other hand, the LAPG shall be conducted to measure the literacy skills of the pupils in Mother Tongue, Filipino and English, and the NAT shall be conducted to measure what pupils/students in Grade VI and Grade 10 know and can do in five core subject areas (Science, Mathematics, English, Filipino, and HeKaSi/Araling Panlipunan) and to assess the attainment of the 21st century skills in varying levels of complexity. The summer classes shall begin on Monday, April 11, 2016 and end on Saturday, May 21, 2016 which is the last day for the final examination. The summer classes shall consist of 3-hour daily sessions per subject area from Monday to Saturday for 36 days. In-Service (INSET) activities for teachers a week before the opening of classes. Conferences and training programs, which are conducted or sponsored by the Department, shall be conducted during the summer break as part of its capacity-building program. Ano po ang theme ng Araling Panlipunan 2016?pls reply. Pwede po malaman kung ano ang theme ng Math Week? Thanks po. Yung theme po para sa high schools. the information is a great help it will lead us to a better implementation of the program. i hope to be updated in email add. maraming salamat po sa lahat ng mga naging daan ng innovations na ito. I just want to ask, the number of school day for the SY 2015-2016 is 201… How come it’s 201 where in fact FEBRUARY has 1 holiday (Feb 8 Chinese New Year)…? It says in the DO that for February there are 20 days… that suppose to be 19 because of the holiday… Which is correct 200 days or 201 days for the number of school days? or icategorized ulit ang mga teacher applicant para mapili yung mas magagaling at hindi naman maiwan yung magaling din..
i was so sad when i learned that my friend was not included in the RQA in our division bec she did not reach the required score of 70, my god naman nagsunog siya ng kilay para makapasa sa LET PRC board exam tapos ganon lang ang mangyayari hindi siya pwdeng mapermanent dahil nid niya umabot pa sa score na 70, ano ba ang mas matimbang ang professional regulation commision license or your hiring guidelines ng deped. Passing the LET exam is only ONE OF THE REQUIREMWNT INORDER TO BE HIRED. Sa nakikita ko, ginawa yan na mahirap ang pag pasok kasi marami applicant and lahat naman ng nag aapply ay board passer. Lahat magagaling. Di basihan ang Board exam uoang sabihing magaling na sia. Kaya nga nag lalaban laban sa position at bawat criteria ay may point yan. Halimbawa dalawa ang nag lalaban sa ranking sa board exam nakakuha ang kaibigan mo ng 100percent passing (hehe) which is equivalent to 10 points. Ung kalaban nia nakakuha ng 80 percent , so 8 points. Then ung interview 10 points, nakakuha naman ung friend mo ng 5 points lang dahil ninirbyos at mali sagot. Ung kalaban naka kuha ng 9 points. Sample lang yan ha. Madami pa criteria like work experience, teaching demo etc.. so kung titingnan mo 1st yung kalaban nia sia second lang. Titingnan naman ngayun kung sino ang naka abot ng 70 sa RQA sia ang nasa list. Natural na ang Deoed ay kukuha ng BEST sa lahat ng BESTS na applicant. Galingan nalang ng kaibigan mo sa susunod. Sabihan mo yung friend mo mag apply ulit ng mag apply. Ako nga three times akong nag apply bago maka pasok as teacher 1 permanent. And take note: bago mag apply kailangan may experience ka sa teaching. Kaya after ko mag graduate noon sa college wala akong sinayang na oras. Next month palang ang graduation dami ko na school na inaaplyan mag vovolunteer. Kaya after mismo ng araw or kinabukasan ng graduation ko nag trabaho agad ako bilang volunteer sa private school. Para mag karoon ng experience and most of all service record/certificate na siang i fa file mo sa application mo. Godbless. Sana makapasok sia. ?? Wala pa po be talaga ang RQA ng Rizal? Hi kelan po Registration ng pept for 2015? And saan po pwede magpasa ng requirements in quezon city are. TIA. thank you for the information. God bless. Maraming salamat din Sir Jhun.. Thank you and may you continue your humble service of giving important updates on education. 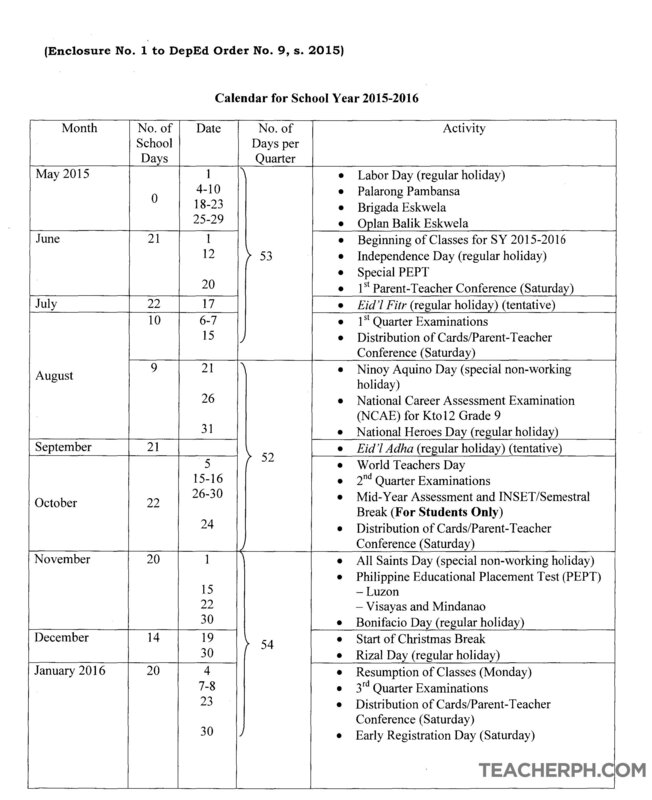 thank for publishing the school calendar for the school year 2015-2016. This will helps us a lot especially that we are in a province. Good job! thanks po sa school calendar. I am a teacher 1 applicant. I am trying to sign in in your account but then I have found out that I must have my tin no.first. That made a delay in my logging in for my application yesterday. I still have to process it today. Is that really a requirement? I suppose that it should be later after we are already been hired. But anyway if that is your requirement what else can we do…. comply before you complain. Am just trying to open up my sentiments. Thank you very much Ma’am for the information. Now my “DepEd kids” doesn’t have the same vacation as my “CHED kid”. This maybe puny to some, but likewise, this can be bothersome to others. But more importantly, this only shows the incompetencies of the implementing bodies to plan and implement what’s best for the populace. Critical thinking MUST TOP the list of qualifications of public officials, particularly in this case, the education sector. – Can somebody tell me what’s going on? – Is there nobody in charge or on top of this? – Why make this “rule” if it’s not mandatory? – Was this just implemented without further planning or justifications? I sincerely hope Somebody answer these without word play. Just as plainly as I asked it. Dear Teacher PH, I wait for your reply regarding my inquiries. Thanks, we’ll get back to you soon. I’ve been trying to update my pds online -for a week now.. but its either 404 problems or there’s a pop up box saying i successfully updated it but still some data were not saved. That is why until now i can’t submit it. What should i do? Thanks for the updates. God bless you more! Thanks for sharing this. A blessing even to private schools. Thanks much for the updates! Thank you for the information. God bless us all ! Thanks so much for all the informations regarding important info/updates we need to know.